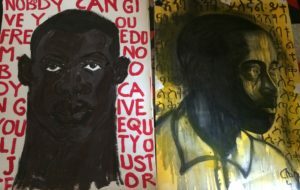 Ephrem Solomon set out to introduce me to the group of artists he grew up with and who, like him, use their art as a platform for social commentary. I return home grateful and fulfilled; the visits I have made with him have brought me closer to the heart of modern Ethiopia. Rosalie van Deursen gives the floor to Ephrem Solomon. 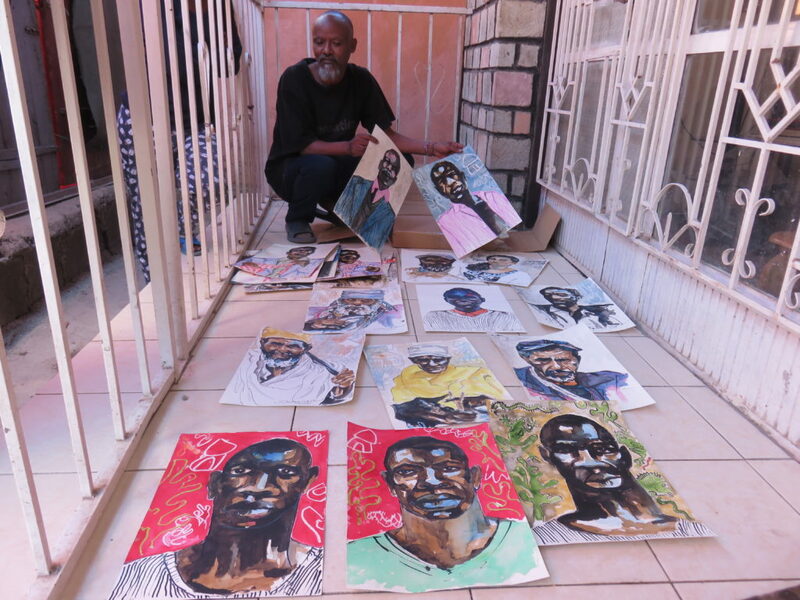 One of my favourite artists is the Ethiopian, Ephrem Solomon. I have been lucky enough to meet him several times and met him again in December 2016 in Addis Ababa. 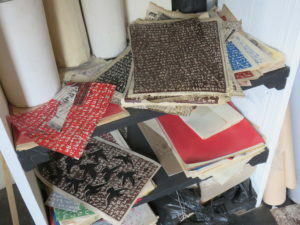 During a visit to his studio he showed me his latest work and as usual for such a prolific artist he has been working around the clock, producing an amazing amount of art, work in progress and experiments. 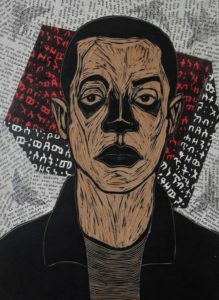 He mainly expresses himself through woodcuts and mixed media, for example by gluing text from Ethiopian magazines and newspapers or his own personal thoughts, to his woodcuts. 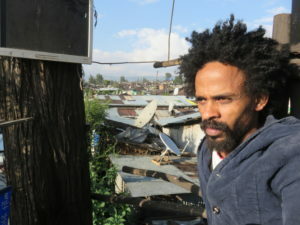 He depicts the daily life of ordinary Ethiopians and the issues they face. These portraits show facial expressions that leave no doubt about the subject’s state of mind. 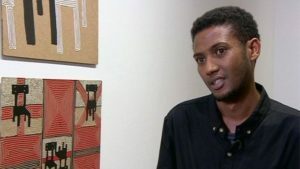 In some works Ephrem calls openly for more equality whilst in others he depicts people as machine-like figures. Taken together, his work shows a rich reflection of the complexities of the current social, economic and political situation in his country. 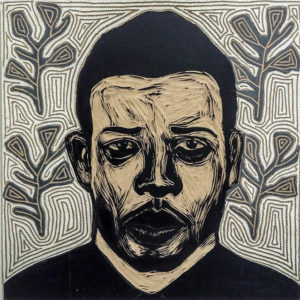 Ephrem Solomon, Work in progress/ Ephrem Solomon, Untitled (Folk Memory Series), 2014. 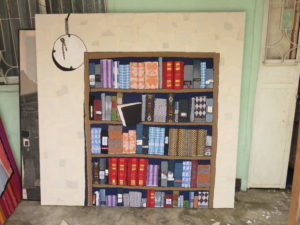 Kirubel Melke, Book Case, 2016. 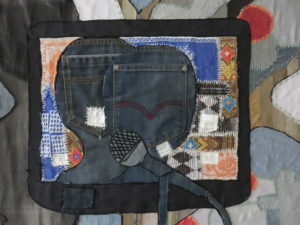 Kirubel Melke, Book Case (detail), 2016. In a lot of his work he uses white cloth known as netela for the background. 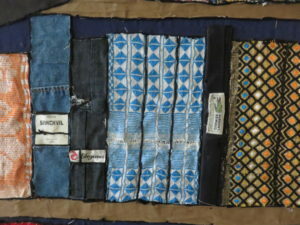 It’s a symbolic fabric used for traditional clothing, worn on special occasions such as church ceremonies. Kirubel wants to highlight the contemporary contrast between tradition and modernity and record such observations for future generations. Kirubel Melke with giant piece with pedestal in Addis Ababa (Kirubel in his garden). 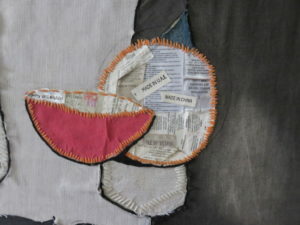 Kirubel Melke, False Fruit (details), 2016. From Kirubel’s garden we drive to the Mercato slum; Africa’s biggest market where practically anything can be found. Some people refer to it as a big pile of junk whilst others swear it houses hidden treasures. 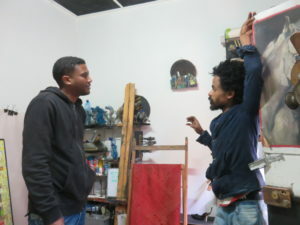 Artist Tewodros Bekele was born and raised here. Entering his small studio, which doubles as his house, is a fascinating experience. 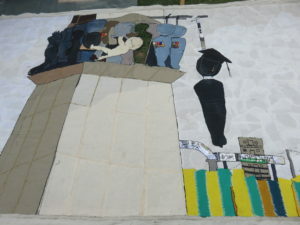 Next to it he has built a giant treehouse from junk and together we climb up and enjoy the beautiful view over Mercato. Tewodros explains that he frequently climbs into his watchtower to meditate and clear his head. He has built it little by little and says he feels like a kid, never too old for an adventure! Tewedros Bekele in his Treehouse overlooking Mercato. 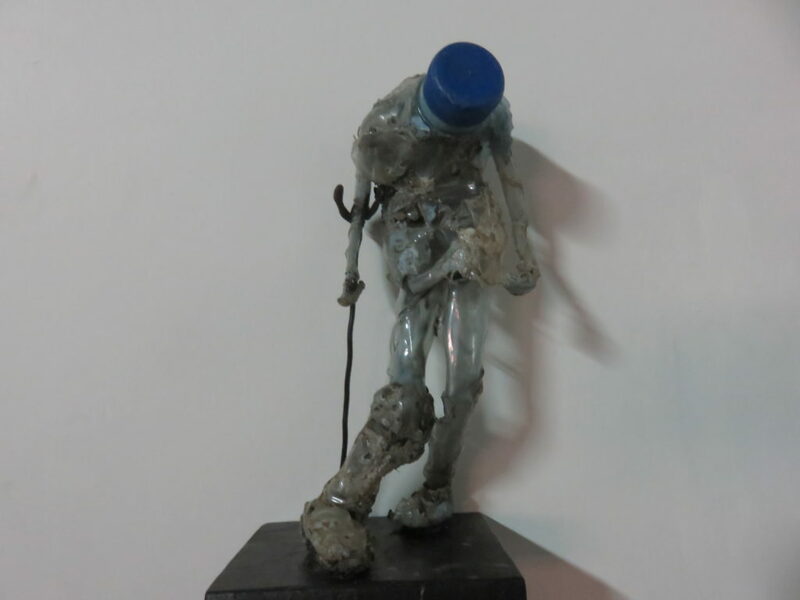 Tewodros Bekele mainly works with junk that he recycles as a direct expression of his concern about the current state of the planet and in particular global warming. 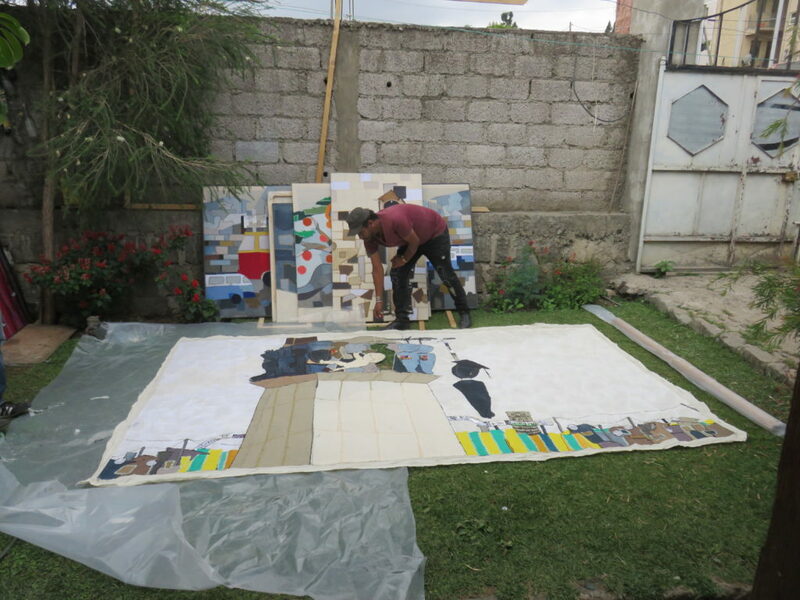 One of his artworks consists of a piece of canvas made with the cloth that people traditionally used to cover their dusty kitchen ceilings. 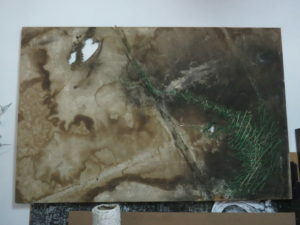 It’s burnt because many people cook inside on open charcoal fires and the hole is sewed together with green stitches. The needle is still visible on the surface. Tewodros: “I want people to think about the hole in the ozone layer, so they start to repair nature. We need to plant trees and grow grass.” In ‘City Scape’ (2016) the hole in the ozone layer is again visible. 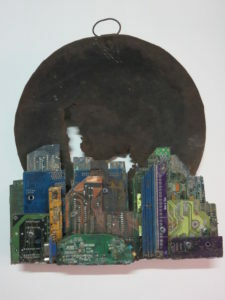 This time he has packed his message in the shape of a cityscape built from a PC motherboard and an oil drum. Tewodros Bekele, City Scape, 2016. Tewodros Bekele, Disabled People, (series), 2016. 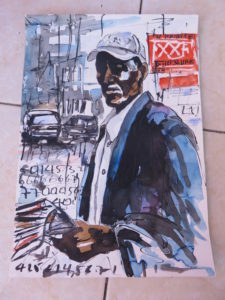 Dereje Shiferaw’s water colors, 2016.